When it comes to getting a new kitchen fitted, it is easy to fall down the trap of picking something straight from a catalogue. This adds no personality or value to your home, and the quality is never fantastic. With a bespoke kitchen from SDP, you can completely tailor make your kitchen to your personality and your needs. Here’s 4 kitchen decorating ideas to make your kitchen, your own. The minimal, black, white and grey colour scheme is becoming more and more popular, but in our opinion, the way to add personality to your kitchen, is by a splash of your favourite colour. This is what makes your kitchen unique and different from everyone else. The colour should be used as a colour pop, and will liven up the room. 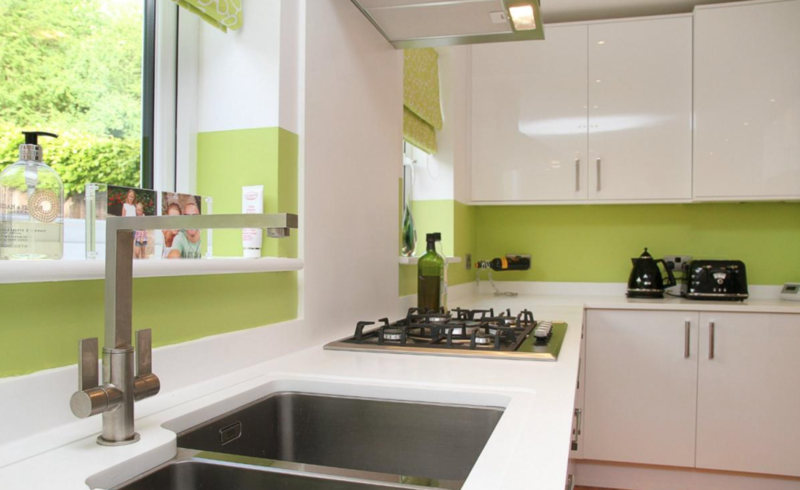 See above how the lime green brightens and lifts the whole space, it brings it to life and adds vibrance to an otherwise monochrome kitchen. Colour is a brilliant way to move forward with a new bespoke kitchen design. To break up bigger rooms, or to add statements to smaller rooms, consider a feature wall or a focal point. See how this kitchen has broken up their living room and dining space by adding a retro 60s style wallpaper. This compliments the neutral palette, and has been replicated in the chairs around the dining table. This ties in the whole room neatly and stylishly, which due to its size, could have easily been distorted and messy looking. Using open shelving is not only space efficient, and tidy. It means you can literally decorate with the belongings you already own. If you’ve updated your kitchen with fresh, fashion-forward colors and a focal wall, it’s time to add layers. The look lightens a kitchen up by creating visual space. 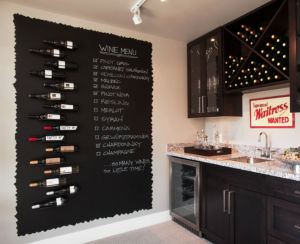 Chalkboard paint is a new trend in modern home decor. 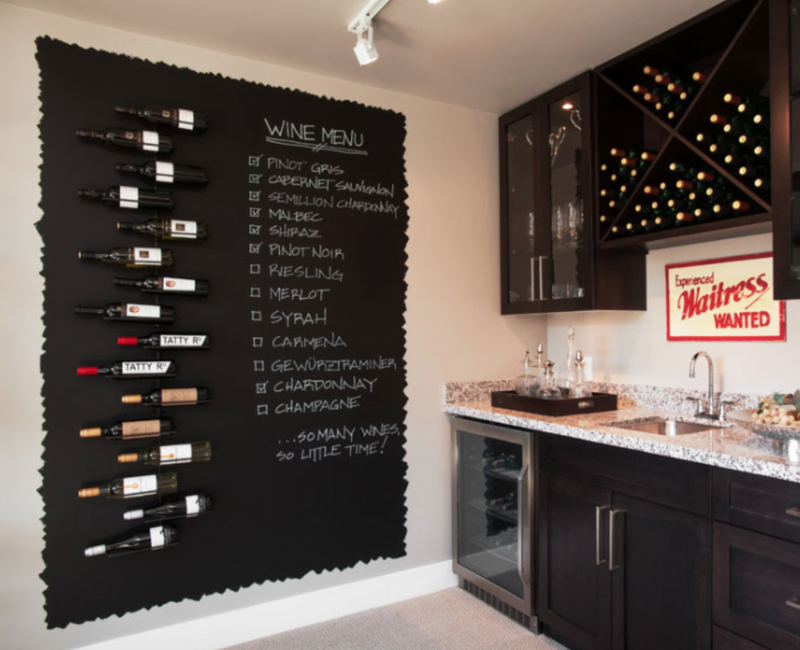 It adds a fourth dimension to a home of literally being able to draw on walls. Not only is it black, so will match any colour, but it is completely personal and can be used for fun, or utility for things such as shopping lists, or meal plans. 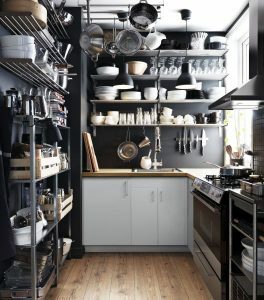 This is a great way to make a kitchen your own, it’s very unique, and very individual to you. Now you have ideas on how to personalise your new kitchen, run with it. 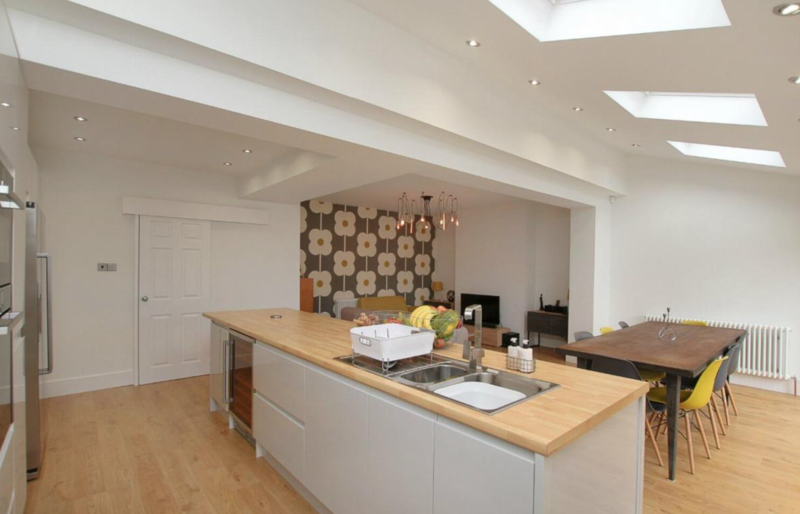 Call 0114 438 7536 or email info@sheffielddevelopmentproperties.co.uk to see what we can add to your home.